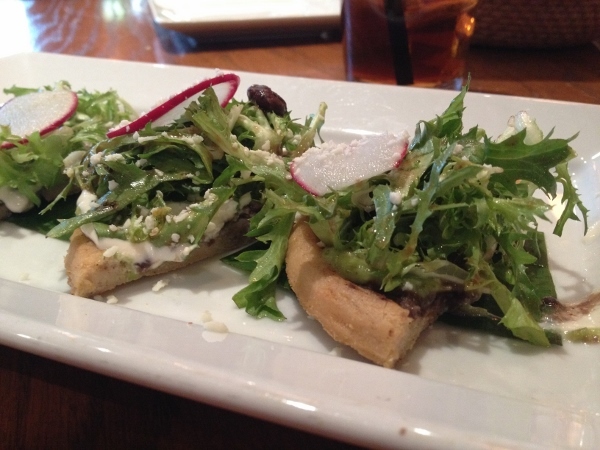 One of my very favorite appetizers in the KC area is the Sopes at Mestizo in Leawood. (I can’t believe I’ve never told you about Mestizo!) I love their margaritas.) Their version of Sopes is a slightly crispy masa shell topped with black beans, a smoky tomatillo salsa, greens and radishes. It’s not only delicious, but also pretty to look at. The serving is petite, just four small pieces for $8. The last time we ate there, I left thinking I should make something similar with a plantain crust. Please don’t ask how I made the leap from masa crust to plantain crust…I’m not sure either. It’s just how my brain works. 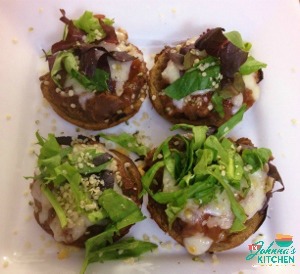 Anyhow…here it is, plantain pizza crust! I’ve been seeing a lot of plantain pizza crusts floating around the blogosphere. Many/most require eggs. My version does not. There are a couple of reasons here, the first being that my hens aren’t laying as many eggs as I’ve been eating. This means I’ve turned to some egg alternatives. And second, it’s still great fun for me to come up with recipes that work for those who can’t/won’t/don’t eat eggs. I’ve used a chia seed gel in this recipe and it works nicely. And you get to sing ch-ch-ch-chia while making them. In fact, it’s required. You’ll notice in the photos I’ve made two different sizes of this pizza crust, one is about 3 1/2 inches in diameter, a nice size for a personal pizza. The other size is quite small, made in a muffin pan. This is similar to my bitesize socca pizza crusts. This is a nice size for appetizers. It also works well if you want to create your own lunchable-type meal. I like packing these little crusts and spreading them with hummus, refried beans, nut butter…just about anything! About the plantains: you’ll want to look for plantains at the grocery store that have plenty of black spots on the peel. Don’t buy ones that are still completely yellow or green. Those are pretty unripe and will be very difficult to mash for the pizza crust batter. If you have never peeled a plantain before, you might find this tutorial from The Noshery helpful. Either line a baking sheet with a silpat mat or parchment paper OR lightly oil the bottoms of 9 wells in a cupcake/muffin tin. In either a blender or spice grinder, place 2 Tablespoons of chia seed. Process until the seeds are powdered. Remove them and place in a small dish with 1/3 cup hot water. Allow to sit and gel for 2-3 minutes. Peel the plantain and cut into 2" pieces. Place them in high speed blender or food processor fitted with "S" blade. Add chia gel and coconut oil. Process or blend until well incorporated and smooth. Now you have your batter ready. 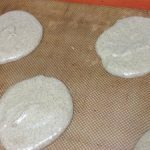 If making 3.5" rounds, pour batter out onto Silpat or parchment lined baking sheet. The batter will make approximately 4 circles. You may wish to use a silicone spatula to gently spread the batter. If you are making bitesize crusts, you will pour the batter evenly into 9 wells of a muffin pan. Bake at 350 degrees, 15 to 20 minutes for the 3.5" round size, 9-12 minutes for the bitesize crusts. Remove from oven and cool, topping however you would like. 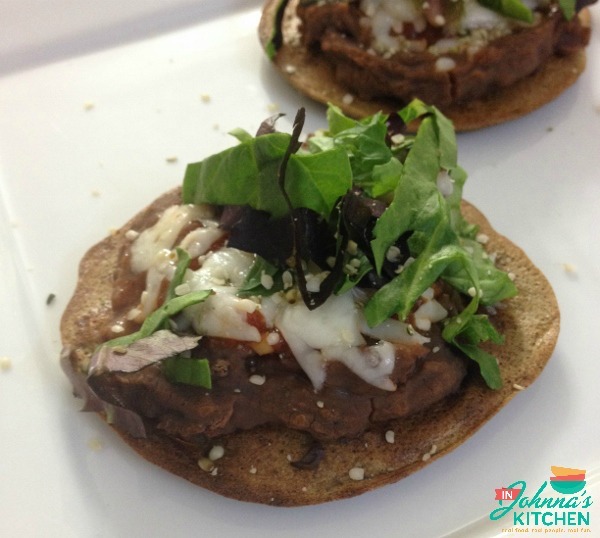 The photos shown are topped with refried beans, salsa, cheese and greens. Enjoy! Disclosure Statement: This post contains affiliate links. Should you click on a link and make a purchase, I may make a small commission. You will still get the same great price. 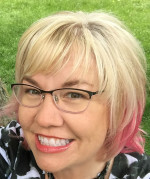 Using affiliate links on my site allows me to continue providing high quality, original recipes tested in my kitchen to you at absolutely no charge. I appreciate your support! « Sound Off Sunday: Where’s the Gluten-Free Section? I’m sure this is tasty but finding black plantains is difficult here in LA??? Why… it is a mystery as we have the largest south American community in the USA. Glad you are safely back for your MINI adventure. I do miss some parts of my MINI life. Interesting about the plantains! I have the best luck finding spotted ones at the Asian market. Seems they don’t ripen very quickly, so when I can’t get them already spotted, it takes FOREVER for them to get there. BTW… I have a new kale pasta dish coming to eatznthingz soon. Kittie says’s it’s nummy. Oh, I can’t wait for that! Kittie’s recommendation is reason enough for me to want to try it!